Because every business location is unique, regardless of how many branding guidelines there are, there must be some room for interpretation. 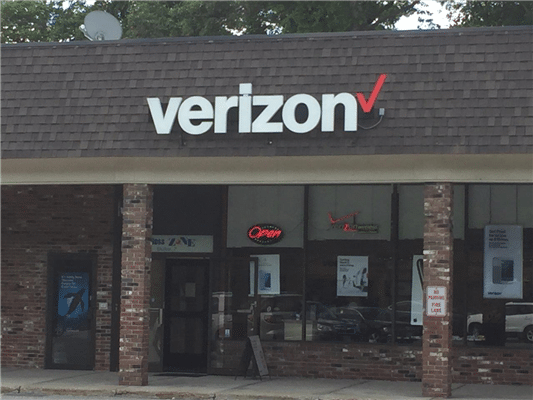 When a Verizon authorized dealer contacts us about updating or installing new signage, we begin the process by requesting Architectural Plans for the building. After reviewing those plans, a Metro Sign & Awning crew does a site inspection to gather other information needed by Verizon to determine if or how its design guidelines may be modified to get the best sign for that particular dealer’s location. Some of the factors include how far the building is set back from the Main Road, how far the front door of the business is from the parking lot, and the speed limit and traffic on the street the business fronts. All of those factors help determine the best viewing height of target V in the logo, and the best placement (perpendicular v. parallel) of the sign. Obviously, it’s critical to conduct the site visit early so the sign can be designed to meet Verizon requirements. At the same time, there is quite a bit of other information to collect, as there are many other factors that affect the sign’s ultimately being approved – most importantly, the landlord’s requirements, and town zoning laws. It’s a layered process, and good communication is the key to keeping the the project moving toward completion. While channel letters are preferred, some municipalities do not allow internally illuminated letters. Some landlords allow only halo lit letters, or gooseneck lighting. Requirements regarding colors, letter heights and depth can also vary. In addition to navigating signage requirements dictated by corporate branding, zoning ordinances and standards set by the landlord or property management company, challenges can be practical as well – such as figuring out how to get electrical service to the sign. We aim to strike a balance so everyone’s specifications are met – and always, of course, ensuring that the sign serves the public, and the company’s customers, by providing attractive and clear identification directing people to the dealer location. The bottom line: signage must work for all parties – while doing its most important job, which is to attract customers.